Measures 20mm including the bail and 10mm wide narrowing. The stone as been faceted into the classic oval shape and is set in a silver mount. Pedidot Green Siberian Quartz is a laboratory-grown crystal which is made in Russia. It is created by a process in which natural quartz is broken down and re-grown with chemicals which are the source of the new colour. 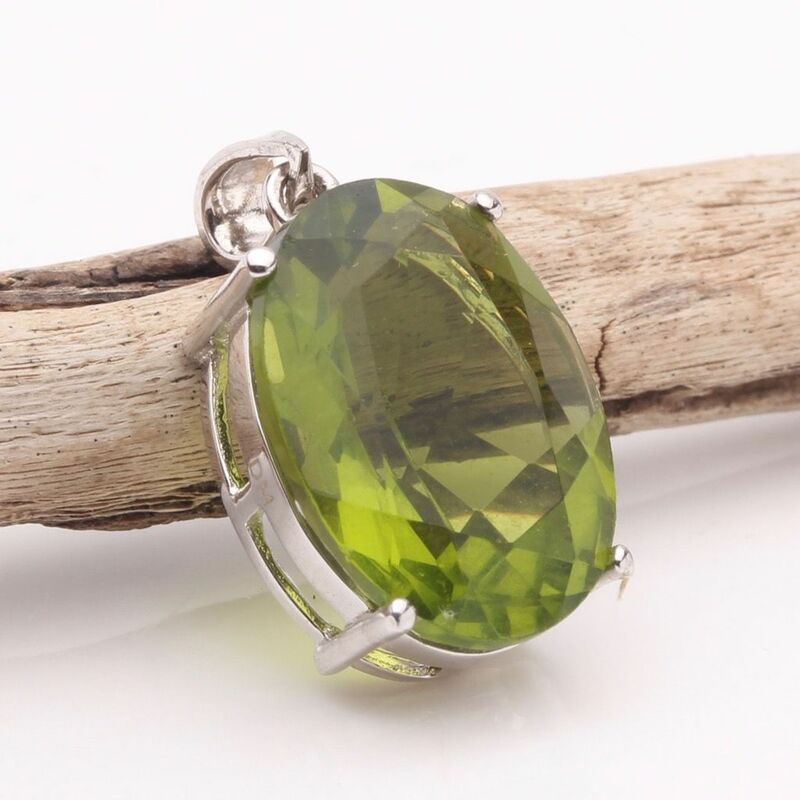 It is suggested that Pedidot Green Siberian Quartz will act and mimic the qualities of Peridot. The 'Waters Stone', beneficial in the cleansing of the mind, body and spirit. Cleanses away impurities, toxin and helps to treat disease; a stone for the healing practitioner, to join as guidance and support. 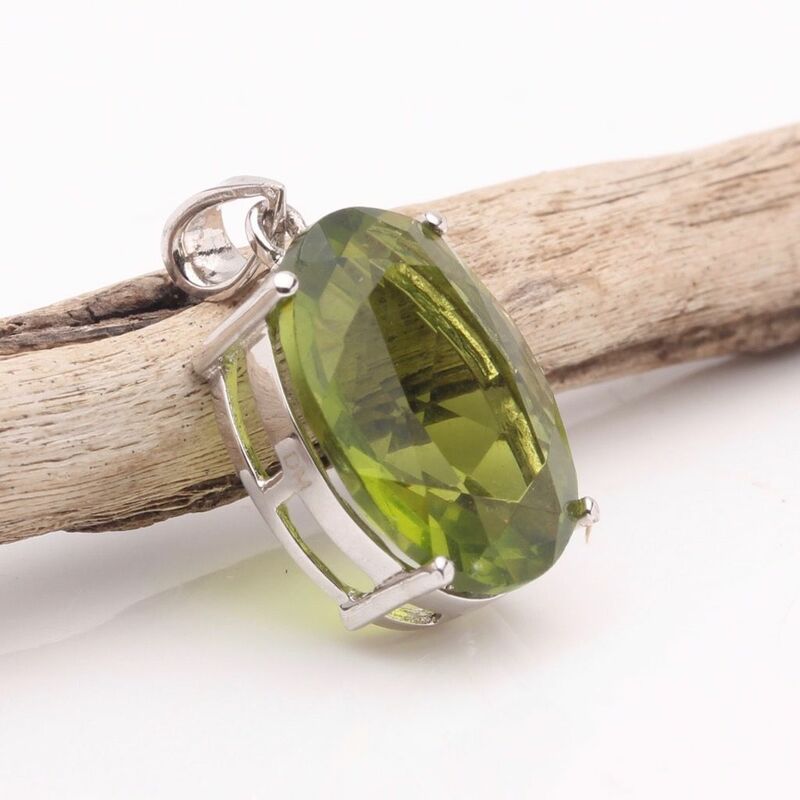 Peridot is that of fresh water, it is pure and brings purity and sparkle to all that it joins with. It is a tonic that can be used when the being has become been run-down, either from stress or sickness, and can help in a detox process. Also, Peridot brings peace, tranquillity and a greater connection with Mother Earth and her goodness. Bringing a realisation of how much the being takes this goodness for granted, therefore creating an understanding, a respect and a finally a conjoining of Spirit. Laboratory grown gemstones are real stones and should not be confused with pressed glass or simulated laboratory created stones.